On a scorching summer afternoon, Mahesh Madhukar Besadkar of Maharashtra’s Lasina village, Yavatmal district, stands in his farmland that he has prepared for the kharif season and points skyward: “All depends on it.” By “it”, Besadkar means the southwest monsoon, which normally reaches the state’s Vidarbha region, where his village is situated, by mid-June and continues till September. The southwest monsoon is vital for agriculture in the region characterised by rain-fed farming. As per the erstwhile Planning Commission’s “Report of Fact Finding Team on Vidarbha”, released in 2000, of the total cropped area in the region, barely 19 per cent is irrigated land and the rest depends on rains. “Last year, we received little and erratic rain. And there was a month-long dry spell that destroyed our kharif crops,” says Besadkar. “My only source of irrigation, an open well, is dry for the past many months and I haven’t been able to cultivate rabi crop of wheat this year,” he adds. 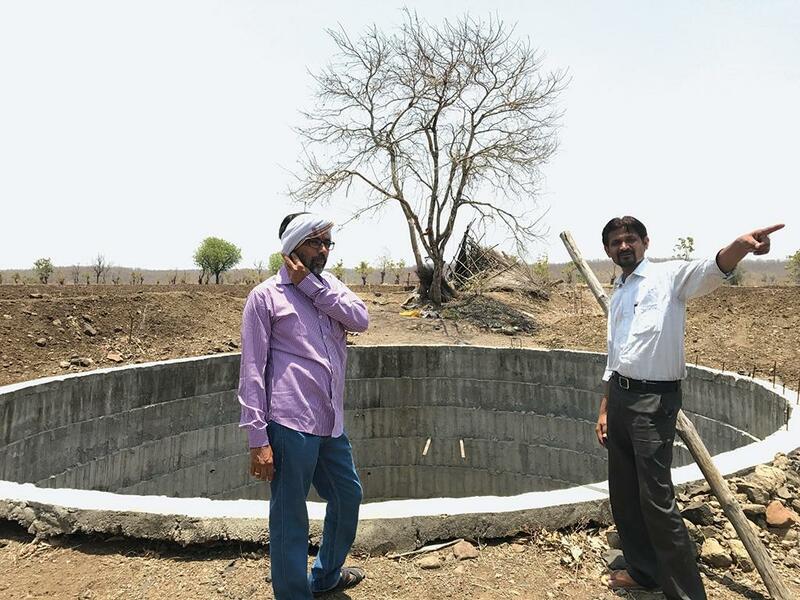 On April 25, the state government declared that Yavatmal was one of the eight talukas in Yavatmal, Washim and Jalgaon districts that faced a “moderate” drought. “The situation is so extreme that drinking water to Yavatmal city is being supplied after a gap of 25 days or more,” says Jagdish Dube, a farm activist based in the district. But the drought does not qualify for any relief measures from the Centre. Why? The reason is a new “Manual for Drought Management”, released by the Union Ministry of Agriculture and Farmers Welfare in December 2016, which says that the states can ask for Centre’s help only if the drought is “severe”. But the parameters that make a drought “severe” are extremely stringent. The Manual prescribes five categories of indicators: “rainfall, agriculture, soil moisture, hydrology, and remote sensing (health of crops)”. On the basis of these the state governments have to make a scientific assessment of drought. Rainfall indices are mandatory indicators, whereas the other four are impact indicators. Droughts are categorised as “severe”, “moderate” and “normal”. While “severe” drought requires at least three impact indicators to be in the severe category, for “moderate” drought, at least two impact indicators should be in the severe category. A “Memorandum for assistance under the National Disaster Response Fund (NDRF) will be submitted within a week of the declaration of drought only if the calamity is of a severe nature,” says the Manual. Agriculture sector experts, however, say that rarely will the three impact indicators together reflect the “severe” category. Take the case of Yavatmal, where despite deficient rain and widespread crop loss, the drought is still categorised “moderate”. Agriculture officials in the district say that the area under rabi crops has reduced from 0.22 million ha in 2016-17 to 0.11 million ha in 2017-18 primarily due to low rain. “The situation is grim in the district and the state government has declared a moderate intensity drought. But that won’t help the farmers much,” says Chandrakant Jaju, the Collector of Yavatmal. “At best, the recovery of electricity bill and bank loan from the farmers in drought-affected villages would be deferred. Collection of land revenue tax would also be delayed by a year along with some more benefits,” he adds. Earlier, the states could approach the Centre for drought relief without restrictions of the category of drought, and ask for monetary help under the Calamity Relief Fund and the National Calamity Contingency Fund.“It is a shame that the Central government washed its hands off of drought relief by introducing strict parameters,” says Vijay Jawandhia, a farm activist from Vidarbha. The new drought definition replaces the paisewari system of calculating drought that has been used in the state since the British period (then it was called annewari system). Under this system, if there is a deficient rainfall and the crop yield is less than 50 per cent of the average of 10 years, then that is considered a drought year. The current rabi crop is not the first time that Maharashtra has been forced to fight drought without the Centre’s help. Even in the last kharif season, 14,679 villages in the state reported a paisewari of less than 50 per cent, which qualified them as drought-hit as per the Maharashtra government criteria. But they could not ask for Centre’s help. “About 80 per cent farmers in the district lost their soybean kharif crop,” claims Gajanan Divekar of Waghapur village. Madhukar Rao, father of Besadkar, also lost his toor (pigeon pea) crop due to the drought. “Last kharif season, I did intercropping of soybean and toor on 2.5 ha. When the flowers appeared on toor, there was no water and I lost the crop,” says Madhukar. The severity of the drought in Maharashtra is also corroborated by data from the India Meteorological Department (IMD), which says that Vidarbha had a rainfall departure of -23 per cent in the last southwest monsoon season. A rainfall departure between -20 and -59 per cent is considered “deficient” rainfall by IMD. District-wise data collated by IMD shows that in the last southwest monsoon season, Yavatmal had a rainfall departure of -44 per cent, -49 per cent and -34 per cent in July, August and September, respectively. 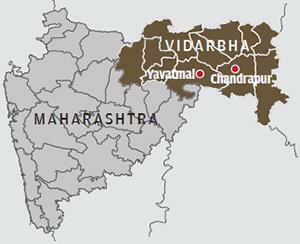 Chandrapur district, which lies 150 km southeast of Yavatmal, too registered a rainfall departure of -26 per cent, -18 per cent, -51 per cent, and -29 percent in June, July, August and September, respectively. In Chandrapur, the agrarian situation is no better and drought has affected Bt cotton and paddy. Kishore Nibrat of Kukarsaat village, for instance, had sown Bt cotton on his 6.5 ha, but due to water stress and pink bollworm pest attack, the yield was barely half. Acknowledging the challenges faced by the farmers, Ashutosh Salil, Collector of Chandrapur says, “Apart from deficient rainfall, of the total 0.18 million ha Bt cotton sown area, almost 0.15 million ha was affected by the pink bollworm pest. In case of paddy, 0.12 million ha of the total 0.18 million ha sown area was affected by the fungal disease.” It was only on May 8, that the state government sanctioned R94 crore and R82 crore for cotton and paddy crop compensation, respectively, in Chandrapur. Four years ago, Maharashtra Chief Minister Devendra Fadnavis had launched Jalyukt Shivar Abhiyaan to make the state drought-free by 2019 by carrying out decentralised soil and water conservation works. But the situation on the ground remains worrisome. “Between 2015 and 2017, a total of 638 villages have been covered under Jalyukt Shivar in Yavatmal district. This year (2017-18), our target was 324 villages and next year another 374 would be covered,” says Jaju. “This year we had to construct 4,500 farm ponds, but have already constructed 5,465,” he adds. But on being asked if all these villages were now drought-proof, he answered in the negative and said that drought-proofing depends on several other factors, including rainfall. Salil also says that the district had 17,000 traditional tanks, (built some 300 years ago), which were meant for irrigation. “As part of the state government’s Majhi Malgujari Talab scheme, we plan to revive these tanks. This year, we have selected 350 tanks. Once revived, these tanks will help deal with droughts,” he says. But Jawandhia remains highly critical of the Centre. “Due to vagaries of nature, farm distress will increase. Rather than assist state governments deal with droughts, the Centre is conveniently looking away,” he says. “Agriculture, which is a state subject, should be brought under the concurrent list of the Constitution to make the Central government responsible for it,” he suggests. (This article was first published in the 1-15th June issue of Down To Earth under the headline '100 days, 44 storms, 16 states, 423 deaths, not a blip').